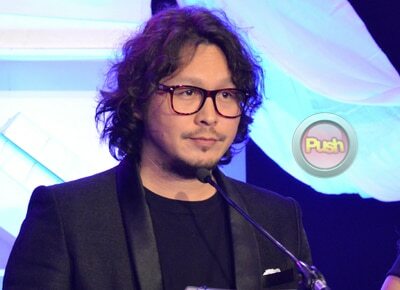 Hot on the heels of Ping Medina’s post on Facebook about Baron Geisler disrespecting him and his director Arlyn Dela Cruz on the set of the indie movie “Bubog,”the controversial actor also posted his side of the story. 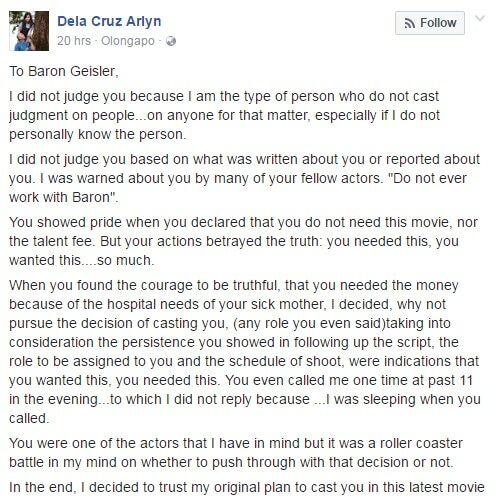 According to Baron, he was not ‘bastos’ on the set and even asked the director he wanted to do something three times but Arlyn allegedly brushed him off. “You can check the BTS (behind-the-scenes) for proof kung bastos ako towards anyone. Wala po. May proof. But you were trying to pull off a Brillante Mendoza, bulong ka sa artista na samapalin mo para magulat or maganda reaction. I was slapped many times. So I thought... ahhh... so it's ok pala to surprise my co-actors sa set. 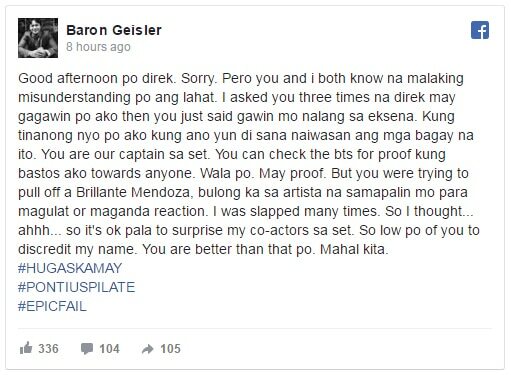 So low po of you to discredit my name,” the actor said in his post. In another post, Baron stated that he’s not affected by Ping’s post. 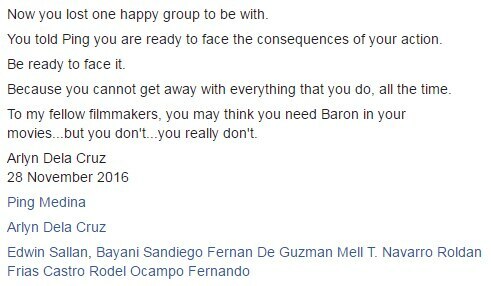 On the other hand, direk Arlyn also posted her sentiments on her own Facebook account. “When you reported on the set, you even happily declared to me, ‘Direk, I am sober for five days na!’ I applauded and even kidded you, ‘Bakit five days lang, ituloy mo na!’ You cannot deny that in spite of the short time that I have come to know you, I supported your intention that you want to live a sober life. Before shooting your first scene, schedule for Day 4, you even told me, you wanted to engage in business and live a different life, a different Baron, different from what others think about you. “I believe that words are a person's truth. My fault is in believing. 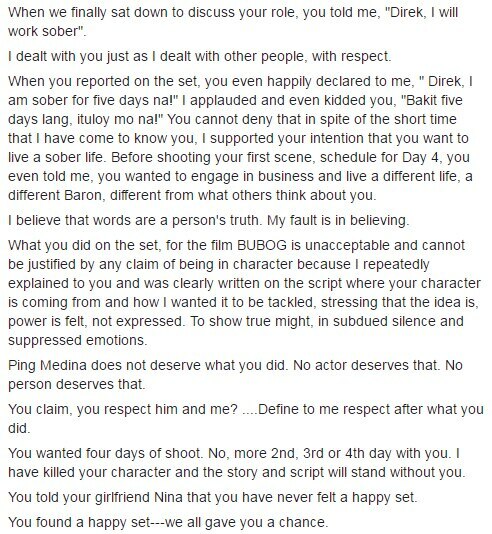 “What you did on the set, for the film BUBOG is unacceptable and cannot be justified by any claim of being in character because I repeatedly explained to you and was clearly written on the script where your character is coming from and how I wanted it to be tackled, stressing that the idea is, power is felt, not expressed. To show true might, in subdued silence and suppressed emotions. “Ping Medina does not deserve what you did. No actor deserves that. No person deserves that.